Wondering what are the most popular school holiday camps and when do most families sign up? See our analysis of registration trends to help with your marketing plans. If you’ve promoted school holiday camps before, you know it can be stressful. You work so hard to come up with a camp that will be fun, engaging, and inspiring for your campers. You coordinate schedules to ensure that you have staff and space. And then you wait — sometimes longer than you’d like — to see if it will get as many participants as you hope. It’s true: school holiday camps don’t get a giant wave of early registrations, like summer camps do. Many families wait until the last minute to buy holiday camps. These leaves you, the camp operator, feeling worried about attendance and staffing during the weeks and days leading up to your camp. Does that mean you shouldn’t offer school holiday camps? Not at all. As we’ve explained before, when you add up all the holidays and teacher work days, kids are out of school for an average 6 weeks during the school year — that’s a big chunk of time for you to grow your business, serve kids, and help working families know their children are well cared-for. What it does mean is advance planning and thoughtful marketing are especially important at this time of year. And the more you know what to expect, the easier your marketing planning will be. With that in mind, we decided to do a little research into past registration patterns for school holiday camps. There are early registrations for holiday camps, but not as many. While it might feel like everyone’s waiting until the last minute to register, that’s not necessarily the case. Our analysis found that 17 percent of families registered a month or more in advance. Those are the customers you want most, because their early planning means less stress for you in the long run. How do you get the early planners to choose your camp? We’ve said it before, but it bears repeating: Get your schedules posted! We’re often surprised at how long some camps wait to share their schedules with families. Don’t make that mistake. If you don’t post your schedules, the early bird families will sign up for something else instead. Post the schedules on your own website and on ActivityHero, too. What are some of the school holidays in greatest demand for camp? The ones where most parents don’t have off work. Columbus Day: Over half of schools have Columbus Day off, but only 14% of business have it as a holiday. Veterans Day: Nearly all schools are out for Veteran’s Day, but only 19% of workers have the day off. Thanksgiving week: Only 5% of workers are given the day before Thanksgiving as a holiday, but many businesses close early. Many schools are closed the whole week of Thanksgiving. Christmas Break: Kids get two or more weeks off, but businesses only give 2-4 days off. MLK Day: This holiday is becoming more common for employees, as 39% get the day off. President’s Day: 34% of business have this as a holiday, but may schools are also off for the whole week of Winter Break or Ski Week. Spring Break: No one’s work holiday matches their kids’ Spring Break unless they work for the school. Be willing to accept last-minute registrations. About 3 weeks before the camp start date, your camp should be at least 25-30% full, and meeting your minimum enrollment mark. Then expect to get bookings from families who wait until the last minute to register. If you haven’t reached your minimum enrollment number by then, consider waiting another week to see if more registrations come in. 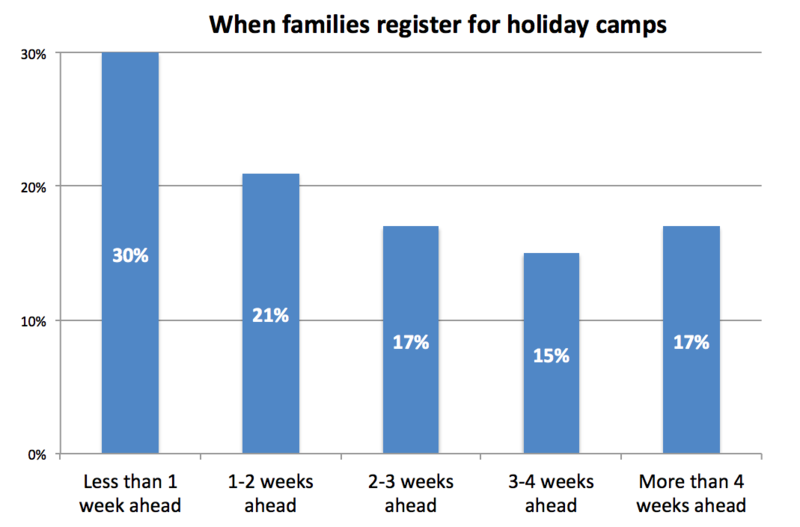 Our data shows that 50% of holiday camp registrations are made within 14 days of the start date. 11% register between 1-3 days of the camp start date. On ActivityHero, we see a flurry of registrations in the hours before any school holiday. For this reason, our recommendation is to keep your registrations open as late as you possibly can. You might even consider taking campers who sign up the morning of camp. We’ve said this before about last-minute summer camp registrations, but it’s even more essential for fall and winter camps. It might mean a hectic few days of phone calls and emails, but ultimately, it’s all about getting that camp as full as possible. Full camps are great for your business, and fun for your staff and your campers, too. With advance planning, school holiday camps can bring a big boost to your bottom line. Add your camp dates to ActivityHero and you’ll reach thousands of parents who are looking for a fun, safe place for their kids during the holidays.